Turkey is to Thanksgiving as chocolate is to Valentine’s Day. The quintessential romantic gift will weasel its way into our homes this month to threaten our healthy New Year’s resolutions and goals. Or will it? What about all the claims that chocolate is actually good for us? What can possibly be healthy about chocolate you ask? In the past few years, there have been studies that have discovered that eating chocolate is not just a delicious treat, but could also benefit our health. Although chocolate is high in saturated fat, it has been shown not to raise blood cholesterol the way that other saturated fats do. In fact, chocolate has been shown to even slightly elevate our good cholesterol (HDL). Chocolate and cocoa, like red wine and green tea are actually rich sources of good-for-you substances called flavonoids. Flavonoids function as antioxidants and can reduce the risk of developing heart disease and certain kinds of cancer. Too good to be true you might ask? Perhaps …. Unfortunately by the time chocolate goes through all the processing in many commercial products we see lining the shelves around Valentine’s Day, the amount of heart healthy compounds are likely inadequate to be beneficial. Also, many of the studies have been funded in part by large manufacturers of chocolate, which should make every reader skeptical. Some of these studies touting the health benefits of chocolate are using certain chemicals that are extracted from chocolate, they are not looking at how chocolate bars act in our body. And lastly – don’t be fooled, chocolate is ultimately high in fat and sugar per ounce which ultimately means more calories. But for some of us chocolate lovers it is at least a little gratifying to know that chocolate ‘might’ have some nutritional value. 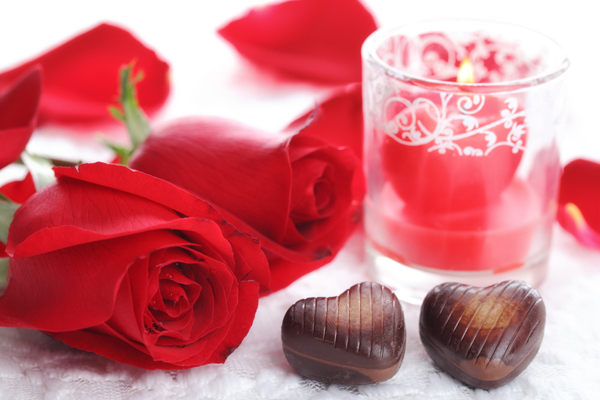 Take heart, there are ways to enjoy some chocolate this Valentine’s Day without tipping the scale. As with everything that is related to food and health, balance and moderation is key. Chocolate in small amounts CAN fit into a healthy eating plan. There are also many fun food choices that can make your family’s Valentine’s Day memorable without eating a whole box of chocolates. Make heart shaped multigrain pancakes or French toast for breakfast. Top with strawberries. Make a Valentine Egg In A Basket for a fun morning treat. Recipe for Egg In A Basket. Slice watermelon and cantaloupe and use a heart shaped cookie cutter to make shaped fruit. Chocolate dipped fruit allows you to enjoy a taste of chocolate while still getting in your ever-important fruit servings. Try strawberries, orange slices and dried apricots. Recipe for Dark Chocolate Dipped Strawberries. Sneak one small dark chocolate heart into bagged or boxed lunches. (You only need a little bit of chocolate to get the job done). Make a strawberry smoothie to add a pop of red to your festive Valentine meals or snacks. Try using chocolate products that are lower in fat and calories, such as cocoa powder. Choose dark chocolate as it has the most health benefits while white chocolate has the least benefits, if eating chocolate. Make hot cocoa with flavonoid-rich real cocoa powder and non-fat milk. Make chocolate pudding with skim on 1% milk for a low fat chocolate treat.